" Articles from: September 2005	"
In a recent interview on MSNBC's Hardball, Tom DeLay explained how District Attorney Ronnie Earle had duped the grand jury into returning an indictment by saying "Oh sure. You can indict a ham sandwich. This is a ham sandwich without the ham." DeLay has spun this indictment as a partisan attack by Ronnie Earle. At the same time, he downplays the role of the grand jurors as mere puppets of the prosecutor. "It was not a rubber stamp deal. It was not an overnight deal. If we needed extra information, it was provided to us," Gibson said. Gibson thinks there is enough evidence to convict Delay. "We would not have handed down an indictment. We would have no-billed the man, if we didn't feel there was sufficient evidence," said Gibson. The evidence is there to prove Delay was involved in wrongdoing and also prove that he and his fellow grand jurors acted independent of political influence, Gibson said. "It wasn't Mr. Earle that indicted the man. It was the 12 members of the grand jury," Gibson said. DIEB-THROAT, Me & Ann Coulter, Election Reform & The BRAD SHOW LIVE! Lots of Stuff! Way Too Little Time! Cramming all of this into a single item, since I'm way up against it here in Portland where I'm speaking tonight (and all weekend) at the National Summit to Save Our Elections. If you're in the 'hood! Please come on by and say hello! UPDATE: Our erstwhile engineer from our BRAD SHOWS in Crawford, Otie Mclay is here, and informs me he's currently streaming as much of the conference as possible LIVE right now at KPFTX.org! Go listen in! Got a call from the Ron Isana radio show folks inviting me to debate with ANN COULTER tomorrow morning at 9am PT (12noon ET). That should be fun. On Delay and Frist, etc. Will try to find a minute or two to bone up on it all late night tonight I guess! --- Insana is nationally syndicated all over the place. UPDATE:See this item for listening links to hear the tape-delay version as it streams live again Saturday @ 3pm ET (Noon PT), and then for the archive posted thereafter. 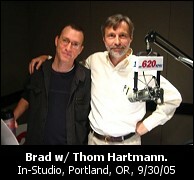 It was nice to be in-studio, as well, this morning with Thom Hartmann up here. He's agreed to appear on The BRAD SHOW tomorrow (LIVE Saturday, 7p-11p ET or 4p-8p PT, with reBRADCast on Sunday at Noon ET). We'll have tons of stuff from the conference, loads of guests, including, but not limited to David Cobb, Clint Curtis, Robert Koehler, Ellen Theisen, and many more Election Reform All-Stars! We won't have phone lines, however, so you'll need to play along here at The BRAD BLOG in our Open Thread during the show. Finally, and speaking of Election Reform All-Stars, Debra LaGuercio of the Daily Republic --- who picked up last week on our initial DIEB-THROAT story --- follows up with more on it this week! 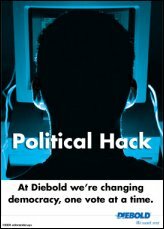 When I wrote last week's Dieb-Throat column about a whistleblower revealing security risks in Diebold touch-screen voting machines, I was deliberately setting myself up for a sucker punch. Go ahead, clean my clock. Make me see stars. I awaited a deluge of feedback, ridiculing me for believing anything posted on a blog (www.bradblog.com), along with mountains of evidence showing that Diebold's machines are perfectly reliable and completely tamper-free, and that our election results were never and could never be secretly altered. LaGuercio did receive "a deluge of feedback," but it wasn't what she had expected. Read the entire thing to find out how it came out. Wish I had more time to cover it today! But suffice to say, a new Election Reform All-Star is born in the media and her article ends simply "America - 1776-2004. R.I.P." I'm reminded of the old Native American (I think) saying, "A path is laid one stone at a time." For some reason the right-wingers seem frustrated and angry lately. 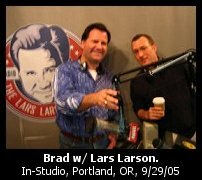 Yesterday, Brad was in studio with The Lars Larson Show for two full hours. The first hour was broadcast regionally. The second hour was a national broadcast with a much larger audience. During the course of the show, Lars' tone seems to change from mature discussion to outright brawling anger. At one point during the second hour, Lars may have been briefly channeling the venomous Bill O'Reilly. How did Brad handle the assault? Listen to the interviews and let us know what you think. of the Sep 24-26 Rally in D.C.
Well ... we are back home - working on the last few articles about our trip to DC. While I try to make coherent sense out of the notes I took, here's the last interview. Stan Goff's essay The Butterfly Effect --- Katrina and Occupation helped me to see that we are all living under occupation. 1. What caused you to become an activist and when was this? TOM DELAY INDICTED IN CRIMINAL CONSPIRACY, STEPS DOWN FROM MAJORITY LEADER POST! Rightwing Swiftboat Attack on Prosecutor --- who Indicted far more Dems than Reps --- Begins! AP reports Hastert as pointing to Rep. David Drier (R-CA), reportedly gay congressman, to take his place. CNN is now reporting that Roy Blunt will be the temporary majority leader. David Dreier and Eric Cantor will also assist in DeLay's responsibilities. DeLay Statement: "I will step aside." McClellan: Bush considers Tom Delay "a good ally". Pelosi: "Republicans plagues by culture of corruption at the expense of people of the USA." The Washington Post is reporting that a no-bid contract awarded to Carnival Cruise lines is the first FEMA contract to garner wide scrutiny. The contract was negotiated to provide housing for displaced Katrina victims. Understandably, many hurricane victims are hesitant to accept housing on the water. It's unclear how exactly how many displaced hurricane victims have accepted housing on the Carnival ships. Assuming that ships have 100% occupancy, FEMA would be paying more than twice the price of individually booked cruises. To critics, the price is exorbitant. If the ships were at capacity, with 7,116 evacuees, for six months, the price per evacuee would total $1,275 a week, according to calculations by aides to Sen. Tom Coburn (R-Okla.). A seven-day western Caribbean cruise out of Galveston can be had for $599 a person --- and that would include entertainment and the cost of actually making the ship move. "When the federal government would actually save millions of dollars by forgoing the status quo and actually sending evacuees on a luxurious six-month cruise it is time to rethink how we are conducting oversight. A short-term temporary solution has turned into a long-term, grossly overpriced sweetheart deal for a cruise line," said Coburn and Sen. Barack Obama (D-Ill.) in a joint statement yesterday calling for a chief financial officer to oversee Katrina spending. CNN reported on the Carnival Cruise contract this morning. View the report in Streaming Real Media or Windows Media. If you missed Michael Brown's "testimony of shame" yesterday, Crooks and Liars has a clip. Think Progress has determined that Brown lied under oath while smearing Governor Blanco. The FEMA/Brownie scandals seem to be business-as-usual for the beleaguered president and Republican leadership. John Conyers wonders if the Wheels are Falling Off the GOP. Reports that DeLay may be indicted soon (AP, Americablog, Austin paper) along with recent revelations that Jack Abramoff may be involved in a gangland style murder must be troubling for the White House. And it turns out that the Valerie Plame case is indeed hanging over the White House like a pall. VandeHei and Baker write: "The federal CIA leak investigation, which has forced Deputy White House Chief of Staff Karl Rove and others to testify before a grand jury, seemed to distract officials and left a general feeling of unease, two aides said. Aides were calling reporters to find out what was happening with Rove and the investigation. 'Nobody knows what's going to happen with the probe,' one senior aide said." Plus The BRAD SHOW LIVE this Weekend from Portland, Oregon! As I'm currently on The Road to Portland (with Bob Hope, Bing Crosby and the lovely Dorothy Lamour!) to speak at the "National Summit to Save Our Elections" my ability to post regularly here at BRAD BLOG will again be somewhat curtailed for the next couple of weeks. However, there is more to come from excellent Guest Bloggers Katrina and Dan Wilcox from their experience over the weekend at the huge rallies in DC, along with the return of other fave Guest Bloggers including David Edwards, Winter Patriot and various other Special Guest Bloggers who may drop in from time to time in the upcoming weeks with some interesting reports! I had hoped to lay low concerning the weekend show for a bit, in preparation for a "step up" for The BRAD SHOW which, to nobody's surprise, is taking a bit longer to get nailed down than we'd like. So hopefully a fix this weekend will do everyone (both you and me!) a bit of good as we move forward! Feel free to help us out with a bit of gas and/or cell phone money (don't ask about my cell phone bill after Crawford!) to help defray all of the above, as we will likely be unable to get ads sold for this weekend's show as we move Northward! And thanks, as always, for all of your various and generous support! With Diebold, Inc.'s financial and ethical and political chickens perhaps finally coming home to roost, Andrew Gumbel, author of Steal This Vote: Dirty Elections and the Rotten History of Democracy in America comes out with some more troubling information on the voting machines sold by America's largest Voting Machine Company. As we write this morning, Diebold's trouble stock prices, which fell nearly 20% over two days last week alone, continue to tumble. DBD share prices are down 2.33% so far in early trading today closed down another 3.3% today! The trouble reported by Gumbel today, comes out of Georgia, vis a vis the Democratic Secretary of State down there and what appears to be some less-than-above-board contractual shenanigans with Diebold and their hardware and software. The report also suggest that votes may have disappeared entirely from Diebold voting machines. Gumbel reports, in a Huffington Post blog item today based on several original documents and contracts obtained via public records requests made by CountTheVote.org's Roxanne Jekot, that recent "elections were run on software that was not only untested but also uncertified, that key components broke down during live elections, that county officials were left clueless on how to operate the new machines because of a breakdown in the training schedule, and that the cost of installing the electronic touch-screen system jumped dramatically beyond the advertised $54 million, without proper legislative oversight or approval." � Georgia ran its first all-touch screen election, in November 2002, with software for which no evidence of legal certification had been submitted. Certification documents were still not forthcoming, in fact, as late as March 2003. Because of a meltdown in the schedule for training county election workers, Georgia ended up abdicating control of the election to Diebold technicians, who ran it on the state's behalf � without the voters being told. NOTE: The 2002 election questioned above, was when Senator, War Hero and 3-time amputee Max Cleland (D-GA) lost his seat in a surpise victory by Republican, Saxby Chambliss who had run advertisements questioning the patriotism of Cleland, and comparing the Vietnam War hero and 3-time amputee to Osama bin Laden and Saddam Hussein. Yes ... dear BRAD BLOG readers, I have not failed you. I have subjected our fearless leader to my interview questions as well. Bless his heart, he answered them. Cindy Sheehan and more than three hundred others were arrested this afternoon near the White House. From the look of this photo (courtesy of MSNBC) it seems she did not resist. The mainstream media have not been quite as silent about Cindy Sheehan today as they were on Saturday; for instance, the Washington Post has an article and MSNBC has another. Sadly, I don't have any inside sources or further details on this one. But I'm certain we'll all be watching very closely. UPDATE FROM BRAD 9/27/05: Blogger, patriot (and occassional BRAD BLOG commenter) "Greyhair" has some great coverage and photos of the arrests! Thank you! Also, RAW has the story of Conyers' inquiry into the troubling reports of hundreds arrested without charges, held handcuffed on buses for up to 10 hours! Have I mentioned "God Bless John Conyers" lately? I love the way Larisa always says what needs to be said. Her column You Are an American really lays out in very clear concise terms who the real Americans are and what their duty is to our Constitution. The news about troubles at Diebold also hit online opinion sites where voting-rights groups long have criticized what they say are security problems in Diebold's voting equipment. U.S. Newswire carried a release saying that a whistle-blower, "Dieb-Throat," was spilling the beans on practices at the company. The insider, when contacted by a reporter, described a company groping to get its voting-equipment business stabilized after a series of equipment malfunctions and sales setbacks. "We have no response to that kind of nonsense," [Diebold spokesman Mike] Jacobsen said. Diebold shares closed Friday at $36.15, down 18.5 percent from Tuesday's close. Apparently, Diebold has no response to all sorts of "nonsense." Like a branch of the U.S. Dept. of Homeland Security sending out a Cyber Alert Bulletin prior to last year's November Election warning that Diebold's central vote tabulator was open to any malicious user who might wish to change the results of an election. Diebold failed, apparently, to offer a security upgrade even after that Alert was issued, and to this day acknowledges it as no more than an "unproven allegation." We're off to see our Representative today. While we're away - here's another interview for you. When I was desperately searching for something that would hold this administration accountable, I came across The March of the Madder'n Hells by Mark Drolette. *EXCLUSIVE! * - SEP. 24th VIDEO FROM WHITE HOUSE PROTEST! Video Journalist Dan Wilcox has provided BRAD BLOG with an exclusive video of the anti-war protests in DC on Saturday, September 24 at the White House. Gives a great sense of the crowd and its size...which none of the cable channels --- including C-SPAN! --- felt was newsworthy enough to broadcast! Includes exclusive footage of Cindy Sheehan and Jesse Jackson in the march. UPDATE: Ron Scott of Detroit News describes the weekend's pathetic coverage by the Cable News channels in his article today: "500,000 People Vanish in Washington, DC"
BREAKING UPDATE (9/26/05): AP reports Sheehan and about 50 others arrested today in front of White House! It's one thing to read the words, or hear the words, but to FEEL the words is unbelievable! On Saturday we FELT the power WE have. When enough of US get together, WE make the rules. Before the march while walking to the Washington Monument there were so many of US flooding the streets WE didn't have to obey traffic lights. Cars didn't matter. WE literally OWNED the ground WE walked on! If WE decide to, WE can become a �rainbow river� (� Dan that at any moment can choose to flow into Washington DC and take OUR White House back.